Learn how to build and use API Client libraries from Swagger to integrate into your applications. Swagger is a machine-readable representation of a RESTful API that enables support for interactive documentation, client SDK generation, and discoverability. While data scientists can work with R / Python directly in a console window or IDE, application developers often need a different set of tools to leverage R inside applications. As an application developer integrating with these web services, typically your interest is in executing R / Python code, not writing it. Data scientists with the R programming skills write the R / Python code. Then, using some core APIs, this code can be published as a Machine Learning Server-hosted analytics Web service. To simplify the integration of your R / Python analytics web services, Machine Learning Server (formerly R Server) provides Swagger templates for operationalization. These Swagger-based JSON files define the list of calls and resources available in the REST APIs. To access these RESTful APIs outside of R / Python, generate an API client library in your preferred programming language, such as .NET, C#, Java, JS, Python, or node.js. This library is built with a Swagger tool. The resulting API client library simplifies the making of calls, encoding of data, and markup response handling on the API. Machine Learning Server provides a Swagger template to simplify the integration. This template defines the available resources in the REST API and defines the operations you can call on those resources. A standard set of core operationalization APIs is available and defined in mlserver-swagger-<version>.json, where is the 3-digit product version number. Additionally, another Swagger-based JSON file is generated for each web service version. For R Server users, replace mlserver-swagger with rserver-swagger in the filename. Core APIs Download Swagger file containing the set of core operationalization APIs from https://microsoft.github.io/deployr-api-docs/<version>/swagger/mlserver-swagger-<version>.json, where <version> is the 3-digit product version number. To build a client library, run the file through the Swagger code generator, and specify the language you want. 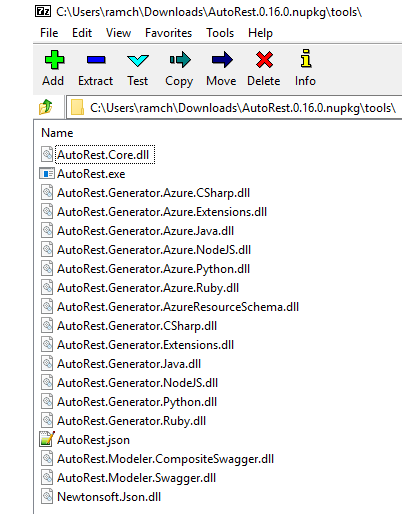 Popular Swagger code generation tools include Azure AutoRest (requires node.js) and Swagger Codegen. Familiarize yourself with the tool so you can generate the API client libraries in your preferred programming language. where <version> is the 3-digit product version number. You can now provide some custom headers and make other changes before using the generated client library stub. See the Command Line Interface documentation for details regarding different configuration options and preferences. You are not required to install a Swagger code generator on your machine. Instead, you can build the client library in your preferred language using an online Swagger editor. Go to http://editor.swagger.io/. The editor appears with default contents. Delete the default contents so the editor is empty. Open the Swagger file on your local machine in a text editor of your choice. Copy the Swagger contents to your clipboard. Switch back to the Swagger site and paste the contents into the online editor. Click the Generate Client button on the toolbar. Choose the language for the client. The client library is generated. You can also build a client library directly in R using the httr package. Like option 2, this option does not require you to install a Swagger code generator on your machine. This is very convenient when you want to publish a web service and immediately generate a client library from the resulting Swagger file. Learn more in this blog post. Keep in mind that all APIs require authentication. Therefore, all users must authenticate when making an API call using the POST /login API or through Azure Active Directory (AAD). To simplify this process, bearer access tokens are issued so that users need not provide their credentials for every single call. This bearer token is a lightweight security token that grants the “bearer” access to a protected resource, in this case, Machine Learning Server's operationalization APIs. After a user has provided authentication credentials, the application must validate the user’s bearer token to ensure that authentication was successful. Learn more about managing these tokens. Before you interact with the core APIs, you must authenticate, get the bearer access token, and then include the token in each header for each subsequent request. Add code to pass the AAD credentials, authority, and client ID. In turn, AAD issues the token. // Address of the authority to issue token. For these authentication methods, you must call the POST /login API in order to authenticate. Now you can pass in the username and password for the local administrator, or if Active Directory is enabled, pass the LDAP account information. In turn, Machine Learning Server issues you a bearer/access token. After authenticated, the user does not need to provide credentials again as long as the token is still valid. Now that you have generated the client library and added authentication logic to your application, you can interact with the core operationalization APIs. This example shows how you can use the mlserver-swagger-9.2.1.json swagger file to build a client library to interact with the core operationalization APIs from your application. For other versions, get the file from https://microsoft.github.io/deployr-api-docs/<version>/swagger/mlserver-swagger-<version>.json where is the server product version. Build the statically generated client library files for CSharp from the mlserver-swagger-9.2.1.json swagger. Notice the language is CSharp and the namespace is IO.Swagger.Client. In Visual Studio, add the following NuGet package dependencies to your VS project. Add the authentication workflow to your application. In this example, the organization has Azure Active Directory. // Once authenticated, user do not provide credentials again until token is invalid. Begin consuming the core operationalization APIs. 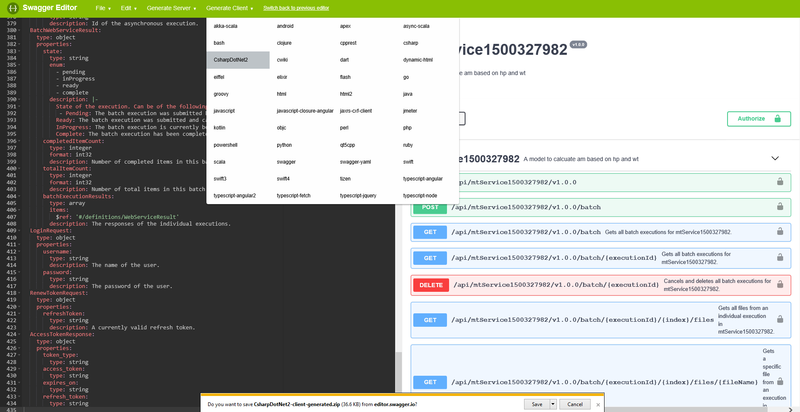 This example shows how you can use the swagger.json swagger file for version 1.0.0 of a service named transmission to build a client library to interact with published service from your application. Build the statically generated client library files for CSharp from the swagger.json swagger. Notice the language is CSharp and the namespace is Transmission. Add the authentication workflow to your application. In this example, the organization has Active Directory/LDAP. // Once authenticated, user won't provide credentials again until token is invalid. Begin consuming the service consumption APIs. The following blog article shows how to create a Java client.